YOU WILL RECEIVE THE CARD IN THE SCAN. I WILL COMBINE ON MULTIPLE WINS. WAIT FOR COMBINED INVOICE. 3 Card Brandon Saad Autographed Rookie lot. 2011/12 Panini Contenders Rookie Card serial numbered 749/800. Card number 206. Card is graded BGS 9.5 2011/12 Upper Deck SP Authentic Future Watch Autograph Rookie serial numbered 451/999. Card number is 238 and is graded BGS 9.5 2011/12 Upper Deck the Cup Gold Rainbow Rookie Jersey Card serial numbered 41/43. Card number is 132 and is graded BGS 9 Free Shipping to USA, Global Shipping Program to everywhere else. Check out my store for more football and hockey cards. Have a good day. This card is serial numbered 14/25. You see the item clearly. I would rate this card as least NM-MT or better. The edges are terrific, the image is well centered and the corners look good. The back of the card is clean. Here is a chance to own a terrific card at a great price. SWATCH IS WHITE. bubble envelopes . 1 or more cards See above See above See above. ALL INFORMATION NEEDED IS LISTED BELOW. Since condition is not important (only that the card has not been scratched), it is at our discretion as to the use of a top loader. You Are Bidding on a 2011-12 SP Authentic Future Watch Brandon Saad Chicago Blackhawks 3 Color Patch Rookie Rc Auto SP 50/100. 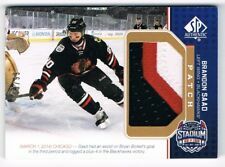 2011-12 Panini Contenders #206 Brandon Saad RC AU /800 Chicago Blackhawks NICE! This parallel card is number 266 from the Rainbow Foil set from 2017-18 Upper Deck O-Pee-Chee Hockey. Card Number - 266. Card Number: #266. Sub Set - Rainbow Foil. Set: Rainbow Foil. Sport - Hockey. Find More Hockey Cards Here!